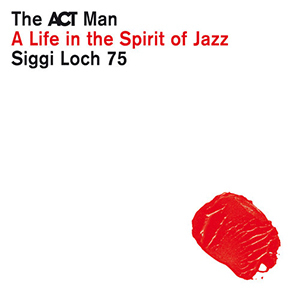 TO CELEBRATE his 75th birthday, ACT Music label founder Siggi Loch releases a 5-CD box set of recordings which chronicle his astonishing 55 years in the music industry. From his early ’60s beginnings as a music rep for EMI Electrola (Universal), it seems the entrepreneurial twinkle was already evident as the twenty year-old travelled his native Germany in a Volkswagen Beetle brimming with newly-imported albums – and in only a matter of months, he became the youngest label manager in the world at that time, accepting a position with Philips. His career blossomed, eventually becoming boss of global business WEA (Warner-Elektra-Atlantic) and then head of WEA Europe (Warner) in London. But, as if reaching that pinnacle wasn’t enough, in 1992 he realised a long-held teenage dream by launching his own label – ACT Music – which, over the past twenty three years, has built its international reputation as a forward-thinking jazz label, and garnering many awards for its achievements. During a five-hour sequence categorised into five disc anthologies (The Beginning; Blues & Rock; Crossing Borders; Visions of Jazz; Jazz at Berlin Philharmonic), ‘The ACT Man’ reveals the depth of his production experience across an exciting half-century’s evolution of pop, rock’n’roll, blues and jazz. And once you set it running – from the chirpy, opening New Orleans clarinet lead of Bechet’s Indian Summer, through Jean Luc-Ponty’s pulsating With A Little Help From My Friends, into Steve Winwood’s 12-bar Hammond grooving (Stevie’s Groove, with the Spencer Davis Group) – it’s easy to become hooked on the collective brilliance of these sixty-six tracks. There’s the fabulous live collaboration of Dave Brubeck’s quartet and saxophonist Gerry Mulligan (Unfinished Woman); Buddy Guy’s unmistakably raw, loquacious guitar and vocal in First Time I Met The Blues; and many a revelation, such as The Motherhood’s psychedelic, early jazz/funk interpretation of Cream’s I Feel Free. Trombonist Nils Landgren released two haunting albums of traditional and modern-day folk melodies with late, lamented pianist Esbjörn Svensson – that partnership is recalled with Höpsi; and E.S.T. themselves – the unequivocally seminal trio who, over fifteen years, grew into ACT’s hugely successful flagship signing – are represented here in classic, heavily grooving style. If the pianistic baton was to be passed down honourably, it would be to Michael Wollny who has demonstrated a similarly intelligent, inventive approach to the piano trio format (Loch identifying him as “the creative pillar of the ACT family” who inspired him to carry on after Svensson’s tragic death), and so Nacht, from acclaimed 2014 release Weltentraum, is included. Both prolific and eclectic in its output, the label’s vocal artists (encompassing rock, folk and jazz) have always featured prominently in the catalogue – tracks from the likes of Viktoria Tolstoy, Ida Sand and Solveig Stettahjell demonstrate their powerful contribution; and not unlike ECM Records, ACT Music has broadened the discovery and appeal of European jazz in its widest sense, bringing prominence to the brilliance of instrumentalists such as Iiro Rantala, Vincent Peirani, Heinz Sauer, Leszek Możdżer, Christof Lauer… the list goes on. Further extending this vision for promoting improvised music through unusual yet illustrious collaborations, Siggi Loch has established a concert series at the Berlin Philharmonic which naturally has rolled out into CD releases; and that aspect is reflected here in an inspiring selection, including Vincent Peirani/Emile Parisien and Chano Dominguez/Marius Neset. At €40 (£28), you may need to consider the investment – and compilations are perhaps less likely contenders for wish lists. But at little more than a fiver an album, this is an absorbing glimpse back into musical history, as well as an entertaining way to make fresh discoveries. Released in the UK on 31 July 2015 – a few days ahead of Siggi’s birthday on 6 August – more information and track listing (which, at the time of writing, does not entirely correspond with the album!) is available at, of course, ACT’s website.